Gizmo | Italian Greyhound in London . Obviously my dog is the best in the universe. 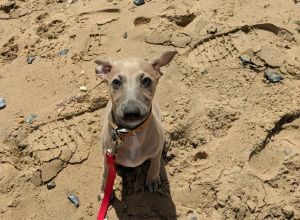 Gizmo is a very young whippet x Italian greyhound. He is hilarious and extremely affectionate to anyome who dares give him any attention. Gizmo loves to be fussed over, he loves the company of adults, children and other dogs. His training is goung really well, he is great off the lead (in a safe, enclosed place), has good recall and responds well to commands.